TOR-M2E is being offered for both the SL-QRM & QR-SAM reqmts of the IA & IAF. Mounting the weapon system on a TATA-built truck is part of Russia’s direct industrial offsets commitment in case the TOR-M2E is selected . However, for the Air Defense Gun RFI the Pantsyr S2 on a wheeled chassis will be offered though the requirement is only for a high-fire cannon & not a combined gun/missile AAA system . That coupled with the current economic mess , am not sure if India can afford the Pantsyr S 2 and will probably opt for cheaper alternatives from Serbia or Poland. Anyways , fingers crossed . 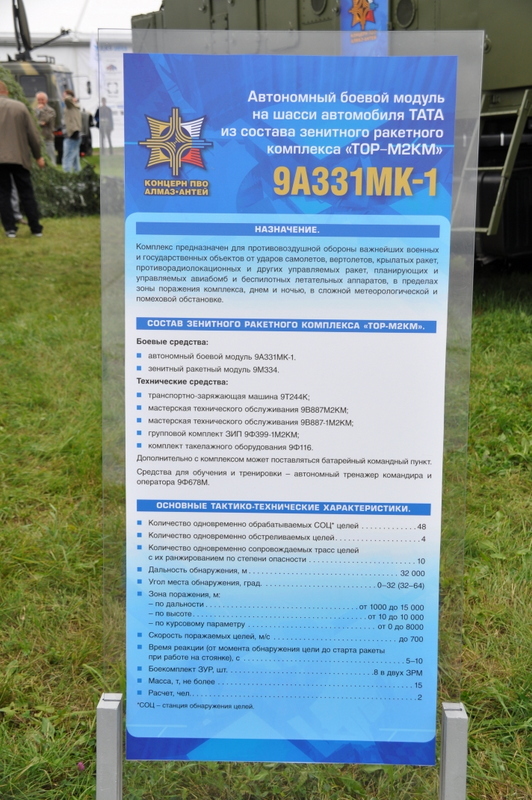 Isn't Tor-M2KM already in production for Russian military? Guns on their own lack the range to be effective... even 30mm cannon are only effective out to 4-5km at most... unless you want to go to a much heavier calibre like 40mm or 57mm calibre then most aerial targets will be able to pick off your air defence vehicles at stand off distances. 40mm and 57mm calibre weapons would lack the rate of fire to be effective against a manouvering aircraft or cruise missile like target and would only be effective in the AAG role with guided shells. The whole reason for the Tunguska and Pantsir is to combine the advantages of both guns and missiles so they compliment each other and reduce costs. Pantsir-S1 is not as cheap as a gun only system like Shilka, but it is not just replacing the SPAAG, it is also replacing the short range missile component, so rather than just replacing the ZSU-23-4 it also replaces both the SA-9 and the SA-13 and if you look at the specs you get a much more effective system. The guns on Pantsir-S1 have much greater range and hitting power than the 23mm cannon of the Shilka with its two twin barrel guns pumping out about 5,000rpm replacing four single barrel guns pumping out about 4,000rpm. The effective range is about 4,000m for the 30mm rounds compared with about 2,500m for the 23mm calibre rounds... in this case the 30mm are 30 x 165mm rounds and the 23mm are 23 x 152mm rounds. The missiles on the Pantsir-S1 are SA-22 Greyhound missiles with ranges of up to 20km and altitudes of up to 15km and can hit targets down to 5m, with 8-12 missiles ready to fire depending on the model. For SA-13 the heat seeking missiles have a range of about 5km with about a 4km ceiling and there are up to 6 missiles ready to fire. Very simply the Pantsir-S1 offers performance much better than Shilka and much better than most other similar short range SAMs in one package without the duplication of having to buy a gun system and a missile system with different vehicles. In other words it seems to cost more... but it actually doesn't if you want decent close in air defence capability. If they just want a gun vehicle then a cheap option would be a Shilka with its 4 x 23mm cannon removed and replaced with a single 30mm twin barrel 2A38M cannon and a couple of Igla launchers on the turret rear. 8 MANPADS and 2,500rpm 30mm cannon fire capacity would be impressive... especially with the radar and electronics replaced with modern optics and compact radar system. (no need for long range radar when targets out to 4km for guns and 6km for missiles will be the standard mission). A bit shorter than Pantsir-S1 (20 km), but the minimum engagement with missiles is better than Pantsir. So, just like Pantsir, targets flying at high altitude are in danger of being destroyed by these short range systems. Depends on the target of course, anything non-cooperative and moving fast will have no problem evading these guys at the last ~25% of their envelope. Wish there was info on the new Pantsir round, 23Ya6. But I am not aware of an export variant, so little chance of seeing @ MAKS. TR1 wrote: Wish there was info on the new Pantsir round, 23Ya6. But I am not aware of an export variant, so little chance of seeing @ MAKS. What do you know about the 23Ya6 round? Please share with us. TR1 wrote: Depends on the target of course, anything non-cooperative and moving fast will have no problem evading these guys at the last ~25% of their envelope. I somewhat agree and somewhat disagree. At high altitude (where the air is thin) non-cooperative targets are less maneuverable. To evade, they will depend mostly on increasing their speed. GarryB wrote: In other words it seems to cost more... but it actually doesn't if you want decent close in air defence capability. Yes, that makes sense . Currently efforts are under way to upgrade and enhance the firepower of the Army’s Corps of Air Defence Artillery by upgrading the fire-control system of 48 ZSU-23-4 Schilka self-propelled air-defence guns . Once this is achieved, the Schilkas will complement the thirty-six 2S6 Tunguska-M1 gun/missile-equipped self-propelled air-defence guns, 12 of which were acquired in 1993, followed by 24 more worth $400 million in 2006. The Tunguska can fire the same type of E-SHORADS missiles as the Pantsyr & can be used for battlefield CMD as well. Since the IA is already in possession of 2S2 Tunguska-Ms, it will make sense to order the latest version of the Tunguska-M1 with certain enhancements . Maximum altitude of Pancir-S1 is 15km not 10km. You can not overfly Pancir-S1 so easily as TOR-M2. You can not really compare Tunguska with Pancir. 3. Problem of guiding longer range missiles with Tunguska radar system and many more. Viktor wrote: You can not really compare Tunguska with Pancir. No , not really comparing the two except for the E - SHORADS missiles . Both TOR & Pantsyr-S1 are optimised for engaging low-flying combat aircraft, helicopters & cruise missiles. Like I said , certain enhancements will be required but this still is the most cost effective option from both procurement and MRO point of view . Pantsyr-S1-type AAA systems are reqd to engage only low-flying targets that in any case cannot engage in high-G manoeuvres when cruising at such altitudes. Using SHORADS to engage gliding PGMs or ARMs is a loss-making proposition & that’s why no one has tried to develop such hard-kill weapon systems, & have instead preferred to deploy soft-kill countermeasures. Instead, it will be more cost-effective to have a layered air-defence network in-depth that will dissuade the combat aircraft from contemplating the launch of such standoff PGMs. As I know original Tor-M2 have 15 km range missiles from the beginning, maybe export one have 12 km range missiles from Tor-M1. Minimum range for Pantsir is not a problem, because range closer than 3 km is covered by guns. I doubt, Pantsir crew will launch a missile on target, when closer than 4 km, but spray in with guns. Even in the last 25% of their flight envelop both these missiles will be moving very fast... faster than the eye can follow. This means that for even a small chance of "dodging" the aircraft would need to dump weight... which on modern aircraft generally means an instant mission kill. Dodging a real missile is like dodging a bullet, though it is not impossible I really don't think the pilot is going to have a good chance of seeing either missile approaching as they will not be trailing smoke or flame and will be moving very fast. Hard manouvering burns up speed and generally results in a loss of altitude and ordinance. For incoming weapons manouvers also reduce speed and increase stress on the target... stress that when the incoming missile explodes will increase structural damage inflicted by the warhead. I recently downloaded a picture (forgot from which site) that I believe shows one of the variants of Germes with the 210 mm booster. that possibly shows a variant of Pantsir' missile with another type of 210 mm booster. Both of these pictures are in need of pixel counting by someone. I can email the first one to you. Any sort of information/ rumour etc. whether Venezuela will indeed be getting Tors (presumably M2EK like Belarus? ), and when to expect an eventual delivery? Thanks. mack8 wrote: Any sort of information/ rumour etc. whether Venezuela will indeed be getting Tors (presumably M2EK like Belarus? ), and when to expect an eventual delivery? Thanks. There are rumors and and it makes sense when you see it. Venezuela acquired S-300VM, BUK-M2 and TOR-M2 is its natural continuation. What the difference between the Tor-M2 and 2EK?? Well, Tor-M2EK i always thought it's the one on MZKT 6x6 chassis (like for Belarus), while the tracked chassis option would be Tor-M2E. Now if we have this new Tor-M2KM, does it mean the tracked chassis option would be Tor-M2M?! Corrections welcomed. I think (but Im not sure) that in that case it would mean that new missile has been accepted in service. So, it seems Tor-M2EK is export wheeled version. I actually did some measurements; the Germes shown in this picture seems to just have the 170 mm booster. Sorry for my misleading guesswork. do we know the total number in service? Few batteries of Tor-M2 + few batteries of modernized TOR-MU. I dont know the exact number but I hope someone who will tell us does . Who knows, but there must be some batteries of Tor-M2, because they were receive in far East, South military district and now in western district.